Just when I was losing hope Microsoft would upgrade the Surface Book this year, the company invited a small group of journalists to quietly announce not just one, but two new laptops. In addition to a new 13.5-inch model, we’re getting a 15-inch Surface Book as well. They start at $1500 and $2500, they pack serious performance, and they finally have USB-C. 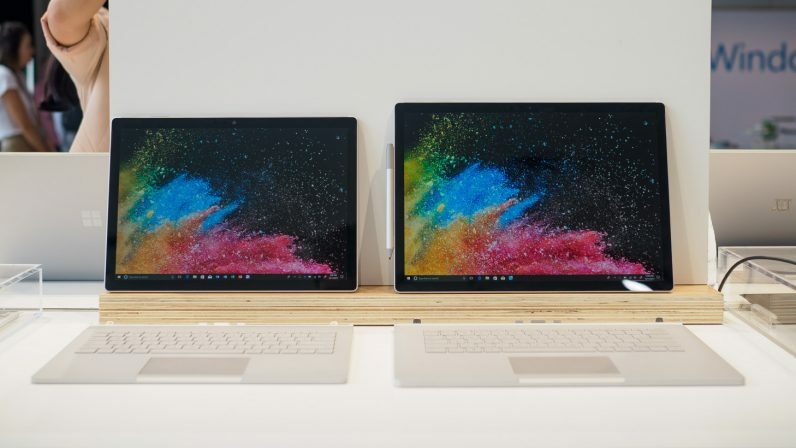 Despite their different sizes, both sizes of the Surface Book 2 feature largely similar specs. They use Intel’s new 8th Gen processors in most configurations, which add two extra cores compared to last year. The 15 inch does run at a slightly higher TDP (20W vs 15W) to maximize performance, but on the whole, CPU performance should be largely similar. The exceptions are the cheapest 13-inch models, which comes with a Core i5 processor and are fanless. Notice the lack of vents on the i5 model to the left. While last year’s mild spec bump to the Surface Book didn’t bother to upgrade the processor because the jump from Skylake to Kaby Lake was so marginal, the leap to Kaby Lake R is much more dramatic. 8th Gen processors are about 40 percent faster than their predecessors, according to Intel, and I’ve seen benchmarks that suggest the delta is greater in apps optimized for multi-threaded processing. We’ll have to test how tangible that upgrade is in the real world, but the choice of graphics is equally notable. This time Microsoft has opted for an Nvidia 1050 on the 13-inch model, which should be a mild improvement over the already-powerful 965M in last year’s Performance Base Model, and a whole ‘nother league from the custom dGPU in the first Surface Book. The 1050 is already enough to play most new games comfortably at 1080p and medium-to-low settings, and will be overkill for older titles like CS:GO. The 15-inch model, however, jumps into legitimate gaming laptop territory with an Nvidia 1060. You can probably bump the settings up to high on many titles. Despite all this new power, Microsoft says the laptops are both rated for 17 hours of battery life (5 hours for the tablet alone). That estimate made with the usual looping video playback test, and is tested on the i5 models, but Microsoft tells me we should expect similar numbers from the i7 models too. So yeah, that USB-C port. It’s exists, and that’s great. I would say Surface fans can finally stop complaining now, but unfortunately, it’s only USB 3.1 and not Thunderbolt 3. It can carry both power and data, but it won’t be fast enough for adding an external GPU or certain drive arrays. I Imagine there are issues with using Thunderbolt 3 alongside the Surface Connect charger, which also supports data. Still of all Microsoft’s users, I’d bet Surface Book buyers are probably the ones who’d be happiest to forego the proprietary adapter for Thunderbolt 3. USB-C at last. Now if only it were Thunderbolt 3…. Other than the new port, you probably couldn’t easily spot any changes to the design of the 13.5-inch model, but Microsoft says it’s redesigned the hinge to be less wobbly. It also seems to have redistributed the weight to prevent the laptop from tipping over backwards. That was one of the more annoying issues with the original model, so I’m glad to see it’s been addressed. The keyboard has also been refined a little to be more like the Surface Laptop’s. Meanwhile, the 15-inch model just looks like a bigger version, and it doesn’t weight much more either; the smaller model is 3.7 pounds, while the larger one is 4.2. I can’t think of any other laptops with the Surface’s combination of weight, graphics, and (claimed) battery life. As a side note, I would’ve loved to see some Alcántara fabric or cool colors on either model, but you can’t win ’em all. Starting at At $1,500 and $2500, the Surface Book 2s aren’t exactly cheap – but they don’t have to be. Now that the Surface Laptop is out and about, the Surface Book line can focus on being performance beasts rather than catering to the ultraportable market as well. We’ll have to spend more time with devices to know whether they’re worth your money, of course – I doubt that 17 hour claim reflects real usage in any way – but they look another impressive feat of engineering by the Surface team.